Charles Neville arrived at Angola in 1963 to serve a five-year sentence for drug possession. At the penitentiary, his reputation preceded him. Neville described his time at Angola during a symposium held on the grounds of the prison on June 10. 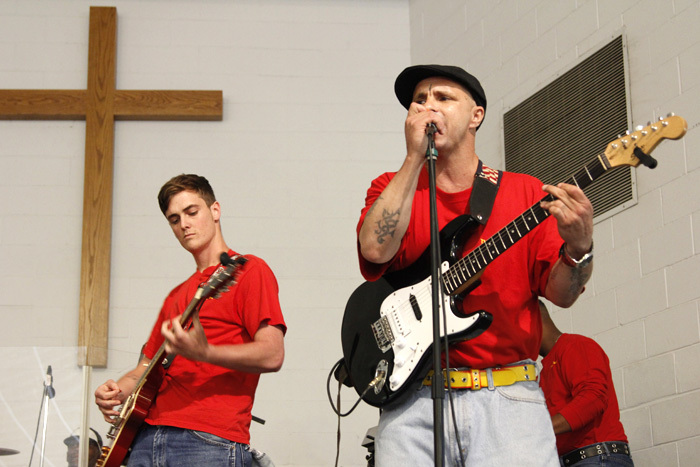 Hosted by the Louisiana State Penitentiary at Angola Museum Foundation, the daylong event included panel discussions and a concert featuring bands formed by current Angola inmates. The symposium was supported by a grant from the Louisiana Endowment for the Humanities. Project director Marianne Fisher Giorlando, director of planning and development, Genny Nadler Thomas, and museum director Marsha Lindsay organized the event, which was open to the public. Nick Spitzer and Charles Neville. Nick Spitzer, host of the radio show American Routes, led conversations with Neville, ethnomusicologist Benjamin Harbert of Georgetown University, and Adam Machado of Arhoolie Records. The speakers covered more than a century of music at the facility in West Feliciana Parish. 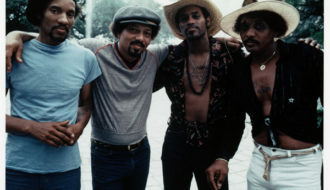 A member of the legendary Neville Brothers band, and already a working musician at the time of his arrest, Neville had little experience in the hard labor typically assigned to inmates. Fortunately for the young man from uptown New Orleans, a position opened up with the prison’s music program when the former music director, an inmate named “Big Noise” finished his sentence. Neville recalled black inmates jamming to John Coltrane as white inmates listened to Buck Owens at the opposite end of a band room that slowly integrated during his time at Angola. Throughout the morning sessions, Neville added his unique perspective as a former prisoner-turned-famous-musician. “Nobody discouraged us from singing,” he said. 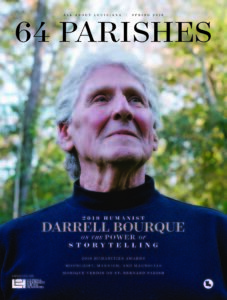 Arhoolie owns the recordings of Harry Oster, a folklorist who visited Angola in 1959 and documented the talents of musicians including Robert Pete Williams, Robert “Guitar” Welch and other inmates. Machado explored the choices made by Oster, who can be heard asking for “more of the moaning” on at least one record. “He knew what he was looking for,” said Machado. 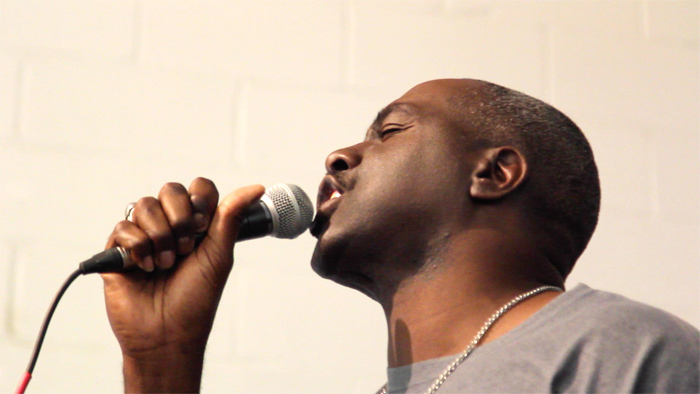 The audience heard a recording of Angola prisoner James Butler singing the Mardi Gras Indian anthem “Two-way Pocky-way.” In this setting, the song sounded more than ever like a freedom chant. 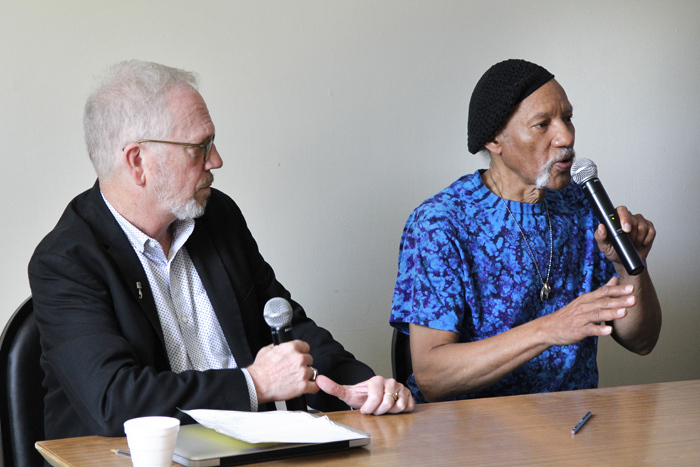 Harbert has spent a significant amount of time at the prison, and his presentation tied together several aspects of Angola’s musical history by focusing on an unlikely genre: jazz. Recordings at Angola typically follow the precedence set by John and Alan Lomax, the father-son team that first visited the prison in 1932. 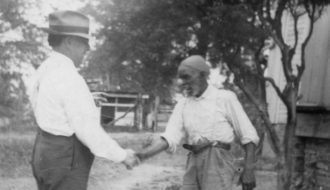 The Lomaxes, noted Harbert, were primarily interested in capturing field songs, gospel hymns, and the acoustic blues of Lead Belly and other inmates–musical forms that threatened to “disappear” as America modernized. Yet the combined effects of stiffer punishments for heroin possession—a tragically common offense for many musicians—and reforms at the prison made jazz a popular choice inside Angola. Harbert discussed the formation of groups including The Cavaliers and The Nic-Nacs, talented prisoner bands that served as “goodwill ambassadors” in the 1950s and 1960s, playing proms, American Legion halls, and festivals around the state. 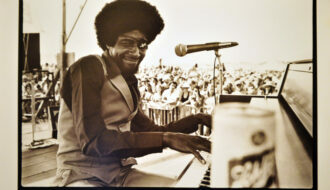 Among the Knick Knacks’ members were Neville, pianist James Booker, and drummer James Black. After a lunch break, visitors boarded muggy school buses and crossed the prison grounds to a chapel where around 300 inmates awaited the afternoon performances. Angola’s 18,000 acres are home to 6,300 prisoners, who live in separate camps depending on their offense, background and behavior. Those with the highest security clearance are known as trustees, men who assume leadership roles and prime positions in the labor pool. Men in varying uniforms filled the church pews or stood in the rear of the room as the bands played, while the visitors sat in a block in the front. It was unlike any concert setting I could imagine—and the music was outstanding. I arrived on the second bus just in time to hear Final Mission, an 11-piece band from nearby Dixon Correctional Institute. A stocky young white inmate with a tattoo between his eyebrows kicked things off with Robert Parker’s classic R&B dance hit “Barefootin.” The singer took turns on vocals with a middle-aged black inmate, both of them powering a crisp set that included covers of Tyrone Davis’ “Can I Change My Mind,” Frankie Ballard’s “Young & Crazy,” and Sam & Dave’s “Hold On I’m Coming.” The most poignant moment, though, came from a guitarist who looked to be no more than 20, a tall, lanky white kid who—perhaps in a nod to the prison’s history—performed Lead Belly’s “In the Pines” in the style of Kurt Cobain. I kept expecting the howl that defined Cobain’s version, but the inmate held steady. Neville took the stage to play saxophone with the Jazzmen, an R&B sextet led Albert Patterson, a dynamic singer who promised he’d be coming home very soon. The Jazzmen’s guitarist, Myron Hodges was a burner who, to the amusement of the band, kept overstepping Neville in the solo line. The set’s high points included a version of Gap Band’s “Early in the Morning” that threatened to get too funky; and Neville’s cool strut through “Hey Pocky Way,” heir to “Two-Way Pocky-Way” and made famous by his band. The inmates in the audience seemed to appreciate Neville’s presence. I wondered, too, if that song reminded them of second lines way out there in the free world. The Final Mission from Dixon Correctional Institution. Larry Wilkerson and Myron Hodges were formerly members of a band they described as “the best prison band in Louisiana during the early 90s.” The band played festivals across the state, entertaining the public in the tradition of The Cavaliers and other inmate groups. Wilkerson recalled an especially cold night in Natchitoches during the annual Christmas festivities. Wind off the Cane River chilled their backs as they played for a large audience. 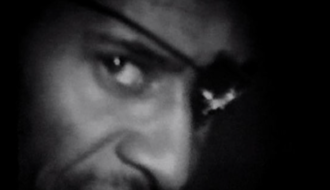 In the distance, Wilkerson saw one of the lights black out, then another and another along the river in a darkening chain that led towards the stage. What the hell was happening? As he watched the lights go out, the sky lit up with fireworks. The band kept playing. It was a beautiful memory, bittersweet with the proximity of beauty and freedom, made possible by music. At the end, we know, the musicians went back to prison. Wilkerson and I shook hands several times, each of us thanking the other for being there. 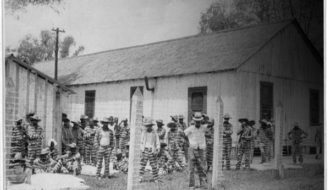 To learn more about the Louisiana State Penitentiary Museum at Angola, visit http://www.angolamuseum.org/. Smithsonian Folkways is releasing a five-CD set and accompanying book spanning the musical career of North Louisiana blues musician Huddie Ledbetter. Prison compound No. 1, Angola, Louisiana. Lead Belly (Huddie Ledbetter) in the foreground.